Manchester United preparing move for ex-Atletico Madrid star? Belgian winger Yannick Carrasco could be offered a return to Europe with Manchester United among the clubs weighing up an approach for his signature. The 25-year-old made the shock move to Chinese Super League side Dalian Yifang last winter and he has since adapted to the surrounding impressively with seven goals and five assists for his side. Despite this, the Belgian has been deemed to be exploring a return to his home continent and according to Foot Mercato, United are among those considering an approach for his services. The Red Devils don't have much concerns in the attacking department with plenty of scoring options within the squad but the club are nonetheless fancied to make a potential offer before the transfer window closes. 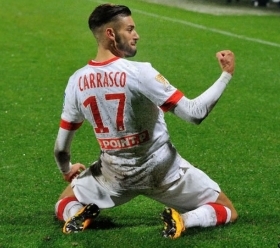 Meanwhile, Dalian are seemingly keen to prolong Carrasco's stay for another season at the least and they are hoping that the recruitment of manager Leonardo Jardim in the near future may change the attacker's mind.